A plaque recognises St Albans Bridge as an Historic Engineering Landmark. This bridge, opened on 27 June 1903, was designed by EM de Burgh (1863 - 1929), an eminent Public Works engineer after whom this truss type was named. The contractor was John Ahearn & Son. 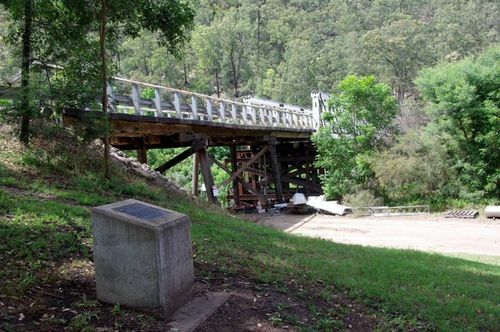 The de Burgh truss was the first composite timber and steel truss and the fourth type in the evolution of truss design for road bridges in NSW from 1861 to 1905. The two 36 metre spans are the longest remaining trusses of this type.